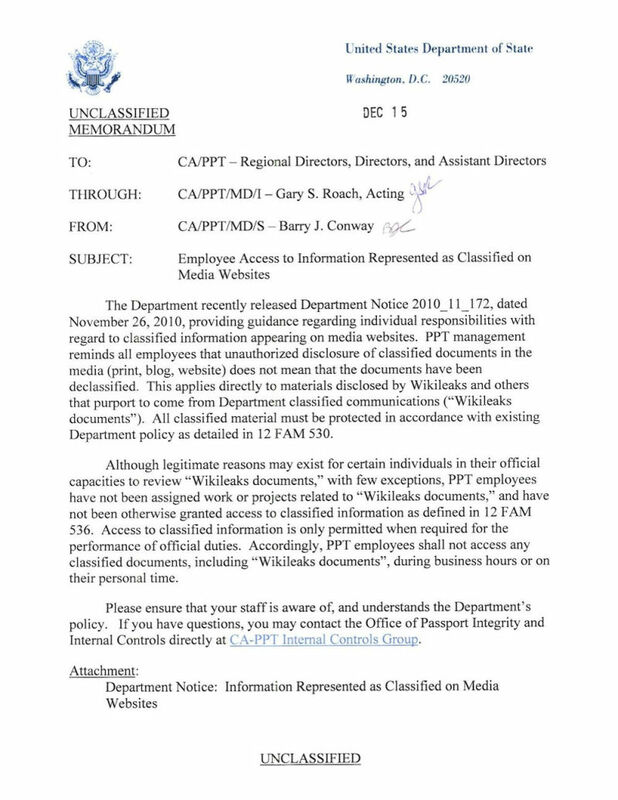 It's clear that the federal government's absurd war on Wikileaks broke free of the bonds of reason weeks ago, but this State Department memo issued today serves as a nice reminder: Staffers can't read Wikileaks cables on their "personal time." 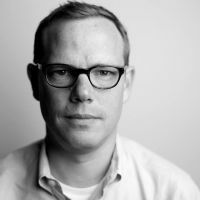 The memo, which went out to all employees in the State Department's Consular Affairs-Passport division, makes abundantly clear what other stern government instructions about the cables have tended to leave ambiguous: The feds don't just want to keep unclassified networks free of classified material, they want to keep unclassified minds clear too. So if you push pencils in the State Department bureaucracy, your boss doesn't want you to know about Muammar Qaddafi's voluptuous nurse, even if you want to read about her on your own computer, on your own time. 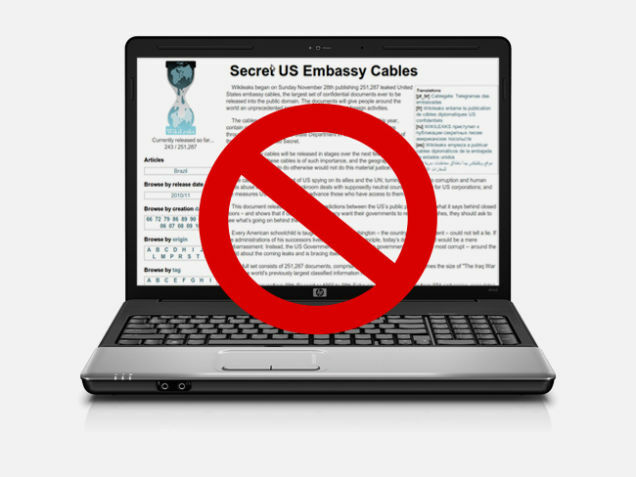 Previous warnings about Wikileaks, like the the Office of Management and Budget's government-wide admonition that the cables remain secret, have tended to leave that part of it implicit. 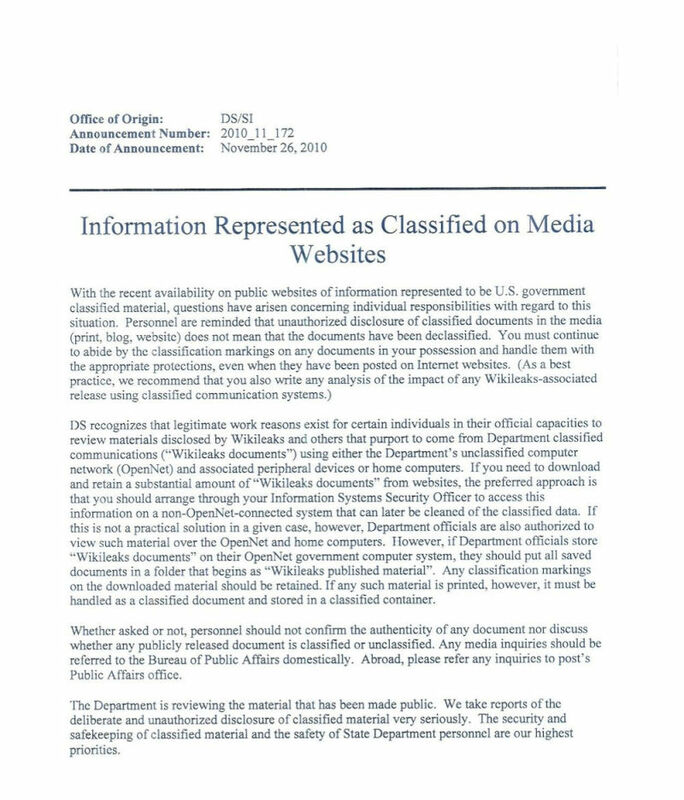 The OMB memo says "federal employees or contractors shall not access classified material unless a favorable determination has been made of the person's eligibility," but it's in the context of a lot of instructions about the integrity of classified networks, so employees could be forgiven for assuming that in the safety of their own homes they're free to read whatever web sites they like. This memo makes clear that they are not. An earlier memo that went out the the entire State Department, was slightly less stringent: Staffers with access to classified data were given permission, if they really needed it, to view the cables on nonclassified networks. But if they printed any of them out, "it must be handled as a classified document and stored in a classified container." Full memos are below.